When it comes to fishing the only tool that an experienced fisher appreciates more than his fishing rod, is a good fishing knife. The market for hunting and fishing knives is vast and it’s not uncommon to find yourself swamped with many options to choose from. The purpose of this article is to help you decide where your money will be the most well spent, allowing you to enjoy your fishing trip with a high quality top of the line knife. Although some of the knives mentioned below are not exclusively fishing knives, they were designed for a multitude of other outdoor activities and will handle fish as easily as any other wild game. Which Is the Best Blade? 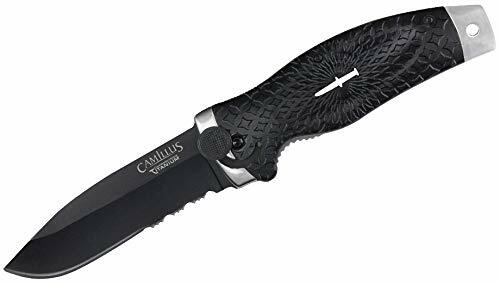 The Camillus Cuda Bolt folding knife sports an 8.75 inch Japanese blade treated in carbonite titanium. The effects of this knife can be seen directly when applied to fish hide and muscle. The strong blade ensures that the knife gives an easy cut, whilst maintaining the anti-corrosive toughness you would expect to see from a stainless steel titanium blade. The blades holster is no less impressive, featuring a bolster of black compressed fiber glass and a lightweight aluminium body. The blade is available quickly, and will spring into action whenever needed. 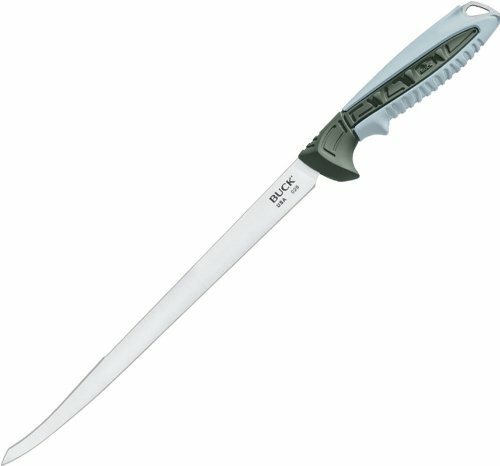 The Buck Clear Water range knives are designed specifically with fishing in mind. The triple-edged blades ensure that the user is granted strong control of the knife. The rubberised handle ensures a secure grip with backside edging that can be used to break down fish for those non-fillet cuts. There is new technology incorporated into the blades of these knives that ensures they are ideal for both fresh and salt water fish. Available in 6 or 9 inch lengths, any fish should be easily handled by these knives. 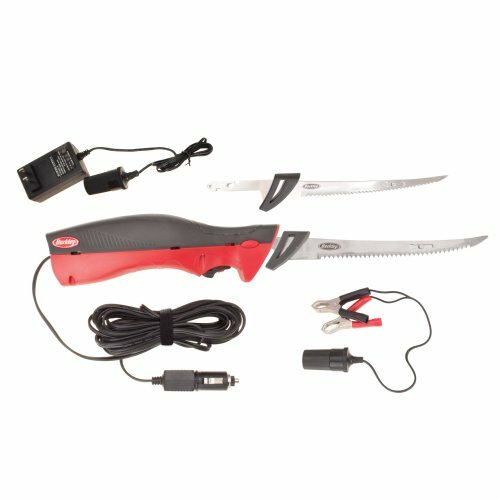 The extra efficiency that is provided by electric fishing knives is generally appreciated as long as a power source can be found. The Berkley Deluxe Knife provides an 18-foot cord and many attachments that allow you to draw power from a wide array of sources, even if they are not close by. The blade can be powered from either a wall outlet, a 12-volt battery or an auto outlet. The knife features a reworked design from older models and provides a more ergonomic feel. The knife set includes two blades, a 6 and 8-inch, to allow for greater versatility. This is all bundled together in a travel bag that allows you to keep the set together. 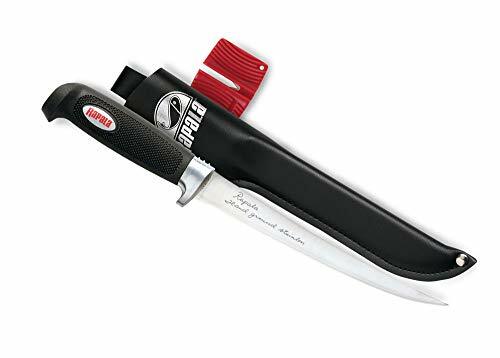 The well-known ice-fishing brand brings a nifty 6-inch fillet knife. The blade is stainless steel and crafted for better filleting performance. Ensure less time spent sharpening and more time cutting. The blade features a laminated hardwood handle that allows for easy control of the blade. Plus, it’s nice to look at. The knife comes with a custom leather sheath, giving the user protection from the elements. This efficient knife is highly recommended for users on a low budget. The Marttiini crafts for Rapala have proved useful for many generations of fishermen, and this knife carries no exception. The beautiful rose wood handle, features the mighty Salmon Kojamo, giving the blade a nice finesse. The 7.5-inch blade makes easy work of cutting up prized fillets. It is stainless, flexible and sharp. What more could you want? The blade comes with a leather sheath and a wooden heirloom gift box. The ever present salt water brand of Williamson knives is no stranger to fillet knives. Manufactured by Marttiini, a company responsible for producing Rapala knives from as early as 1928. One of their newer fillet knives comes with an 8-inch blade that allows precision work. 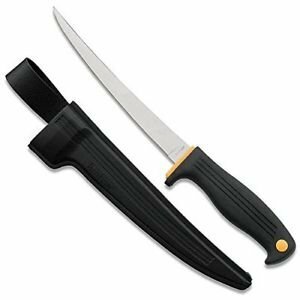 The molded handle is designed to provide a relaxed and comfortable grip that allows for easily and manageable filleting. The European stainless steel blade makes use of a mirror-polished finish and an ever useful progressive taper, giving the blade an extremely sharp cut. Ultimately the choice of which of the blades above is best comes down to your personal opinion and needs. Depending on your budget and intended fish, each of these blades has their positives. This selection of blades is in no way a complete display of the wide array of options available to fishermen these days, but it is a top notch selection of blades that are ensured to perform well. Any of these above blades will leave you satisfied and happy to be filleting with ease.